I’ve had a blast these last few weeks working with BASH Theatre people to make a film version of actor-playwright Cristopher Berns’ new short piece Phone Calls. This is one of the more unusual and wonderful projects I’ve had a chance to do lately, and I’m excited that both the theater and film versions are on the bill this Saturday, June 27 at 3:30pm in the final show of On the Boards’ Open Studio Series. Phone Calls is a glimpse into the lives of five people aching for love, acceptance, and connection. With an unconventional use of time and space, this nine-minute short piece experiments with text as a kind of musical score, challenging both actors and audience to listen in a different way. I invite you to join us for Open Studio as BASH members and friends of BASH perform original works, including short theater and dance pieces, exploring our search for love, connection and a sense of belonging. In 1909 my great-grandfather Cassius Marcellus Forbes purchased 120 acres of Iowa farmland. He was a school teacher, not a farmer, and he deeded the land in my grandmother Erma’s name. Perhaps he was looking to the future, or maybe he liked having a stake in the agricultural community that surrounded him. Regardless, that piece of farmland stayed in my family for generations, even after my grandmother left Iowa. Since the 1930s, the land has been farmed by multiple generations of the same family, the Swansons. This is how I came to meet the central subjects of FIELD WORK: A FAMILY FARM. We had no relatives in Iowa when I was growing up, so I had never had much contact with the farm. In 2008, I decided to visit the current generation of Swansons. I’d heard a lot about how we’re losing family farms in this country, but here was a family who had a clear vision of staying family-sized. Their dream, they said, was to bring their two sons back into the operation and farm as one extended family. That year, I started shooting FIELD WORK, ultimately following the Swansons through the recession years as their sons grow up and set out on their own, and they work to pursue this dream of farming together. Meanwhile, the financial crisis hit, and crop prices and expenses were a roller coaster. Unable to afford more land, the Swansons had to get creative about what direction to go. I had the opportunity to be in the field with the farmers through several growing seasons, observe their challenges and joys, and see farming first-hand through their eyes. I met and talked with other farmers in the area, bigger and smaller, as I began to put together a picture of one farming community. Old friends Lauryn Shapter and Dennis James, the Iowa-based duo Truckstop Souvenir, joined in to create amazing, heartfelt score and songs that capture the feel of the landscape. 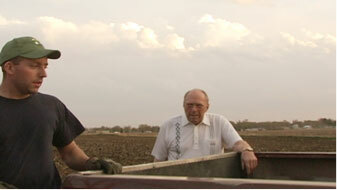 FIELD WORK: A FAMILY FARM debuts on Iowa Public Television this week, Sunday April 12 at 1pm statewide. I’m thrilled to bring this story back to Iowa where it all began. Huge thank you to all the farmers and folks who took time to appear in the film, as well as to Humanities Iowa, Seattle Arts & Culture, 4 Culture and Artist Trust for making the documentary possible. This fall, I’ve been working with actors Lisa Every, Jenn Ruzumna, Carter Rodriquez, Sara Rucker Thiessen and Eric Jordan to develop the story of a new film through improvisation, just like we did with Phoebe’s Father. The kinds of movies I love, and love to make, are about believable characters in familiar conflicts – a friendship dissolving, a family rift, a breach of trust. They capture something truthful about our struggles in everyday life. How can we best tell these kinds of stories? I believe that working with actors early on is one very good way. Taking inspiration from Mike Leigh (whose movie Secrets and Lies I adore), the Brown’s Canyon actors and I are building the characters lives over time. We start on an individual level – every actor creates the details of their character (their family members, friends, childhood memories, favorite objects, talents, schooling, etc). Then, we put the characters together, in situation after situation, being very specific about when and where we are in their individual lives. Each improvisation builds upon the last. It’s extremely exciting – the story evolves in front of us, and we have no idea what’s going to happen next! It can be confusing and complicated, too – for the actors, to be clear about whether it’s the character or the actor making choices; and for me as director and writer, to observe and listen and choose when to make an adjustment and when to push the action forward. Typically, a movie is written and rewritten many times by a screenwriter, often with producer and director input, long before the actors come on board. With this improvisation process, we try to uncover a deep understanding of the characters before scripting. There are loves, lies, jealousies, and secrets. When Jenn, Sara, Carter, Eric and Lisa come on set to shoot the film, they will know better than anyone how their character thinks and behaves. If we’ve done our work well, we’ll make a movie that is as believable and as real as can be, a story that moves and entertains while being true to life. I’m excited that FIELD WORK: A FAMILY FARM will join the fourth season of KCTS 9’s REEL NW series, premiering April 11 with the wonderful SAVING LUNA. 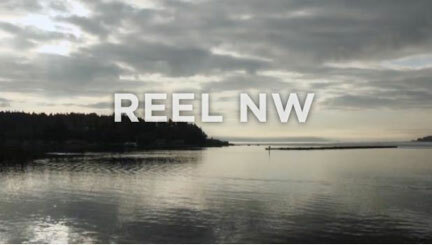 Nine weeks of films from the Northwest. FIELD WORK airs at 9pm on Friday April 19. We had a great screening last night at American Documentary Film Festival in Palm Springs. Packed house and an exuberant Q&A for FIELD WORK: A FAMILY FARM. Every audience since I started showing the film has contained more than one person with a connection to a family farm in the American Midwest. Of course it’s not surprising – not that long ago the number of farmers in this country was far greater than today, and so many of us are tied in some way to that culture. It is a fundamentally American experience and a few are keeping it alive. Thanks to all who attended, I enjoyed talking with you – and to Teddy Grouya and the AmDocs team for building up such a vibrant festival in three short years. We’ve been enjoying the warm days, crazy winds and kind hospitality of our hosts here in PS. And we’ve seen some absolutely amazing documentaries – two of my favorites have been Happiness… Promised Land by Laurent Hasse, and Searching For Bill by Jonas Rasmussen. If you love docs, check these out!